A look at The Thing (1982), John Carpenter’s masterpiece starring Kurt Russell, Keith David, and Wilford Brimley. John Carpenter is on board to co-produce and direct Darkchylde, Randy Queen’s popular comic. 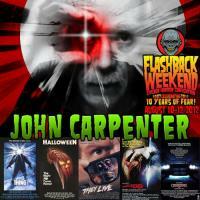 John Carpenter’s 1978 classic is reviewed. Thirty years old and still awesome.